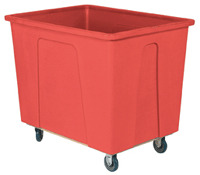 Ideal for textiles, dyes, powders, or corrosive chemicals. One-piece molded polyethylene construction features seamless .125" thick walls with rounded corners. 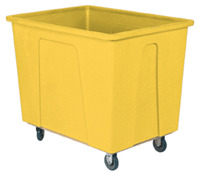 Rolls on (4) 5" polyurethane casters—(2) rigid, (2) swivel. 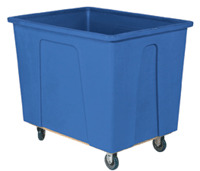 Trucks have casters mounted to a plywood base. SPECIFY COLOR: BL - Blue, GY - Gray, RD - Red, WH - White, YL - Yellow. FACTORY QUICK SHIP—FOB PENNSYLVANIA.